Yesterday, I saw my regular OB. At this point, these appointments are almost a waste of time to me. I see a perinatologist monthly too, and my appointments with him are much more interesting. Right now, with the OB, I pee in a cup, get weighed and we listen to the heartbeat. And then I'm pretty much done unless I have any questions. Since this is my third pregnancy, I really don't have many questions, and the ones I do have, I ask the perinatologist. However, yesterday, I had a good question to ask, that my perinatologist couldn't answer since he's not going to be the one to deliver the baby, someone at my OB's office will. Since I had Toby early, I know everyone is concerned about me having this one early too. With good reason, the odds are rather high. But, if I can get past the premature weeks, I wanted to know about the chances of getting induced since my labors, so far, have been very fast. I am mainly concerned about getting to the hospital. Especially, if I happen to go into labor in the afternoon, if this happens to be the case and I go into labor at say, 4 PM, I will most certainly deliver without James because he won't be able to make it home on time due to the time that it takes him to get out of his office and drive back home in DC rush hour traffic. 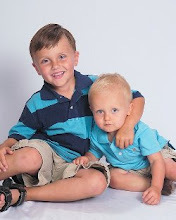 Plus it will be on me to find a place for the kids to go and a ride to the hospital or an ambulance ride. I am lucky/unlucky in that the contractions are not noticeable until they are intense and only a couple minutes apart. I was almost surprised when I was told that, absolutely I can be induced for that reason, that it is scheduled all of the time...the catch?...I have to reach 39 weeks. So I have to say, I will be very surprised if I make it to 39 weeks, but if I do, I'm sure I will gladly "get it over with" one whole week early! And I will love it if I actually get a chance to walk into the hospital standing upright, not in panic mode to get me to the maternity wing! They say bad luck comes in threes. Well, I hope that is the case, because we have had a streak of bad luck over the past few weeks and we don't need anymore! First of all, as I had posted a while ago, our roof sustained considerable damage a few weeks ago during a bad wind storm. We got our new roof put on on Friday. I can tell you that I chose a very pretty shade of shingles, but they are so high up, you'll just have to take my word for it! We had quite a bit of rain in between the time of the shingles flying off and when we got the new shingles put on, but I think we got the repair done on time before it caused any other considerable damage. Well, I hope so! Then, after all these months of being back Stateside, I finally got fed up enough and wanted my TPMS (Tire Pressure Monitoring System) fixed on my car. In fact, it was what I asked for as my gift for Valentine's Day. James did end up buying me something different but said to go ahead and get the repair done. I was really hoping it would be a free or inexpensive computer reset, but it was not. There were parts and labor involved. Ridiculously expensive tiny little parts! But we finally got it fixed and it's nice not having that bothersome light lit up on the dash anymore. All in all, it took three appointments in Germany and two appointments here to get it fixed! It was kind of a hassle for such a silly repair! And then, a few nights ago, our water heater died. It was the original water heater that came with the house--it was 18 years old. The day that it broke, I had done a few loads of laundry and two loads of dishes and I know the hot water was working. After dinner, James went to start a bath for the boys when he discovered there was no hot water. Sure enough, I went downstairs, and it was leaking. But luckily the leak was slow enough that it was contained in the closet that the water heater was stored in and the drain that is built in there was carrying away most of the water. So all in all, we were lucky. We turned off the main water valve for the night and had a new water heater installed the next day. This week, in preschool, they focused a lot on St. Patrick's Day. They do lots of art projects. Toby brought home art with gold, shamrocks, leprechauns, etc. He was absolutely fascinated with St. Patrick's Day. He was intrigued by leprechauns and wanted to know if they were real, where they lived, do they start out as babies, etc. On the day of St. Patrick's Day, upon awakening that morning, he ran into my room, and wanted to "find the rainbow and the pot of gold! ", he was certain it was in the back of our house. As the day went on, he grew more and more depressed that he hadn't found the gold yet. They made wooden leprechaun masks which each child colored, and that has been the prized possession of the week--it has gone everywhere with us! It has been such a funny thing to see him be so interested in. He has been more excited about St. Patrick's Day than he was for his own birthday or Christmas! Funny kid! A Lifetime Member of the All-Boys Club! Last Tuesday, James & I went to my 16-week sonogram. 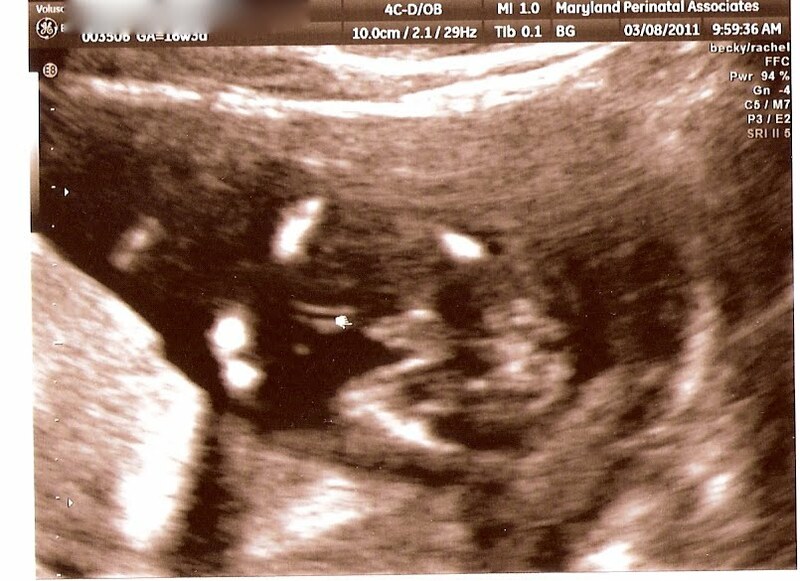 We knew this was most likely the "exciting one" where we would find out the gender of the baby. Upon our arrival, our sonographer cautioned us, "At 16-weeks, your baby is still pretty tiny." "I can make an educated guess but please do not go out and buy a bunch of clothes and certainly don't go out and paint your walls!" 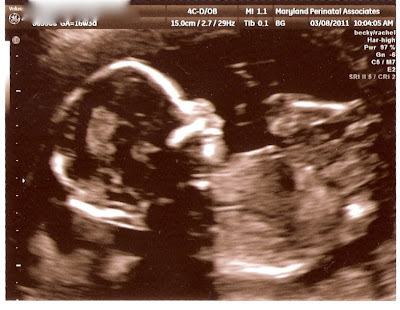 But, our baby was not shy and, as the sonographer said at first glance of it's parts..."Well, that is FAIRLY convincing!" We think so too. (It's a boy!) Since then, I have gone out and bought some light-weight sleepers since a lot of my NB and 0-3 month clothing is going to be way too warm! I took the news pretty well. I was very realistic that it was probably a boy. But of course, there was a glimmer of hope, especially since this pregnancy has been so different from my other two. There were a couple days of letdown and accepting that this will be my family--no daughter, but I'm fine now. I'm just glad he's healthy & now to find a name for him! And, no, we're not sharing this time nor are we asking for suggestions...especially from my dad! That will be our big surprise to share when he arrives. Toby was mad for about 10 minutes and then he was over it. Thomas is still trying to accept that it's not a girl. James, who has always been adamant that he never wanted to have girls because "they are far too emotional and I would have no idea what to do with one", finally admitted that he would have "been fine" if it was a girl, but "I'm fine that it's a boy too" which is about the closest thing to admitting that having a girl wouldn't have been the end of the world after all in his book, that I've ever heard from him in the 13+ years that I've known him! The Flu: 2 out of 4--And: He's Back! Last week, Toby came down with what seemed to be a very, very miserable cold. He ran a low-grade fever, had a dry cough, runny nose and seemed run-down (he took 2-3 hour long naps--and he doesn't nap any longer!) for about four days. I'm not the kind of mom that runs off to the doctor, usually, at the first sign of a runny nose. I did consider it, but then the fever went away so I never took him. Six days later, on Wednesday, I woke up with full sinuses and a slight runny nose. I didn't feel great, but I didn't feel bad. I thought it might even be allergies. I went about my day, in fact, I enjoyed another day where my pregnancy wasn't slowing me down. Later on that night, Thomas had scouts. I took him and was still just fine. As I drove home, I started to not feel well. I got the boys bathed and off to bed and I realized that every inch of my body ached! I went to bed before 10 PM, and before midnight, I woke up with the chills. The next morning, I knew I had to get to the doctor. I hurt all over. My nose would not stop running and I had a cough. I felt guilty because I realized that Toby most likely felt this bad, and I never took him to the doctor. I knew with the symptoms and with how fast this came on, it was most likely the flu. Thomas had a late-start morning at school due to parent-teacher conferences, and this was one of those instances where I was so glad that I now have a son who can be pretty self-sufficient and helpful when he needs to be. I was so tired and weak but Thomas poured himself and Toby a bowl of cereal and got them each a drink for breakfast and I stayed in bed an extra hour and a half. We all got dressed and out the door and you better believe that I was the very first patient at the Urgent Care Center in my town! And that is the truth! The doctor agreed that with my symptoms, it all certainly pointed toward the flu. However, the rapid flu test he gave me came back negative. Although that test is a terribly unreliable test, lots of false negatives. We discussed it and decided to treat it as the flu anyhow and get me started on Tamiflu right away. Apparently, the flu and pregnant women are not a good combination to be had! Tamiflu is an anti-viral that lessens the severity of the flu symptoms and speeds up the duration by 1-2 days. The Tamiflu made me nauseated and hurt my stomach. It says you can take it with or without food, and I took it with food right from the start. But, after two doses, I figured out it needs to be LOTS of food and a full glass of milk and then I'm fine. Two days later, I'm on the mend, but still not great. I ran a few errands this morning and came home out-of-steam. I'm going to try to get some extra rest today and tomorrow. And where was James during all of this? Well, he was in Vienna, Austria! He left last Saturday and returned Friday night. He had a layover in Frankfurt, Germany, Friday morning, which had me a little nervous because of the two Americans that were killed there only two days before, but he said there was nothing to worry about. He never even left the airport. It's good to have him home. When the wind blows at 60+ mph hour speeds like it did last Friday, your shingles that were on their "last leg" get to be replaced whether you like it or not! In a couple of weeks, we're getting a new roof (shingles) I guess! Hopefully before we get anymore substantial rain or snow that will cause other damage to our house.